The R250 million Athlone Centre has risen to become one of the largest commercial property developments in Pietermaritzburg set for completion in 2018. It’s also set to greatly boost economic growth prospects in the region. Willmeg Investments is heading the project, who is the property development subsidiary of Mattland Holdings, based in Howick. Maitland happens to be the holding company of Sutherlands Home Furnishing, the main contractor being GCP Projects SA, from Pinetown. According to Paul McCabe, Mattland MD, construction started on Athlone Centre in August 2017, with the plan being a grand opening event on March 28, 2019, upon the building’s expected completion date. Athlone Centre is being billed as being extraordinary, and unlike anything Pietermaritzburg has seen to date. 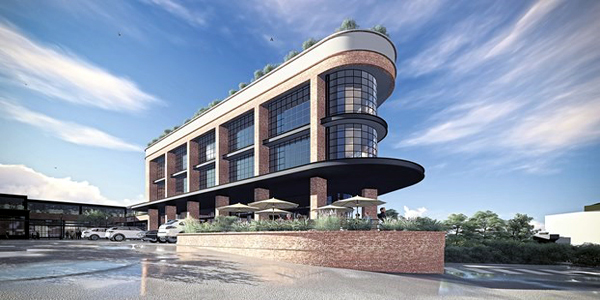 It will feature a modern, unique red brick revival architecture, which has evolved to become a signature of property developments undertaken by SHF founder, Craig Steel. Although Willmeg has continued to expand into many properties around South Africa, Pietermaritzburg remains home. This is evidenced by the development of the Athlone Centre, along with many other Pietermaritzburg properties. Describing how the development came about, McCabe said Steel had to drive past the vacant site every day on his way to work and felt all the time that it was perfect for development. “Craig is passionate about Pietermaritzburg. He chased the development, he got it,” said McCabe. “It is going to be an upmarket premium development that will strive to cater for the shopping, entertainment and other requirements of the neighbouring communities. We have taken a great deal of time to carefully choose the retail tenants so, for the most part, they won’t need to go to any other place.” Everything points to this only being the start of Willmeg Investment’s dominance of the commercial South African property sector.